Finally! Spring is here, and garden planning is in full gear. If you’re anything like me, your tabletops, cold frames, or greenhouse are overflowing with little growing plants getting ready for their new home outdoors. Every year I try growing a different type of plant from seed. And it seems every year I manage to kill several of my tender plants before they even make it into the ground. It can be terribly frustrating. And as I sit mourning the loss of weeks of nursing my plants from seed to seedling, I consider whether I should try to start more from seed, or just buy replacement plants at the local nursery. This year is proving to be no different. I’ve already annihilated about twenty beautiful cabbage and broccoli plants by freezing their roots overnight in a cold greenhouse. Oops. My mother-in-law so generously went out and bought two flats (24 ct each) of cabbage and broccoli to replace them. What would I do without her? It kinda feels like I cheated by using nursery plants, but in the end food is food, and if these plants do well we’ll be blessed by it. Although starting plants from seed isn’t the easy way to go, I still prefer it. There are so many advantages to growing your plants from seed. Yes, it’s a lot more work, but there are many good reasons to learning how to grow your garden from seed versus buying nursery plants every year. If you’re weighing your options and considering whether you should try raising your garden from seed this year, here are some pros and cons for you to consider. Variety– When buying plants from a local nursery, you will only have a couple of varieties to choose from. The great thing about seeds is that there are dozens upon dozens of different varieties to drool over. Red carrots, purple potatoes, black tomatoes… so many fun new options! Cost– By far, seeds are way cheaper than plants. You can buy a pack of seeds for less than $2 and have over 100 seeds in the pack, as opposed to paying about $.50 per plant from the nursery. Saving Seeds- If you are interested in saving seeds for the next years’ harvest, you need to plant heirloom varieties. Most nurseries will not carry many, if any heirlooms at all, so your best option is to buy heirloom seeds. Not only will your produce be tastier, you’ll only have to invest in seeds one time if you learn to save them properly. Seed Swapping– Another great thing about having seeds is that you can swap varieties with a friend, or barter with a neighbor. Less Dependence– Once you learn how to raise your own plants from seed, as well as saving seed from year to year, you’ll no longer depend upon somebody else to start your garden for you. There’s definitely a learning curve when it comes to raising your plants from seed, so learning now, before you depend on your garden for survival, is a really good idea. Time– Raising plants from seed takes several weeks of daily care before it’s time to transplant to the garden. Space– When planting your entire garden from seedlings you started yourself, you must have somewhere to put all of those plants while they are germinating and growing. This can take up quite a lot of room, depending on how large your garden will be. Equipment/Tools– When starting plants from seed, you’ll need containers to plant in, seed starting mix, a spray bottle to water the growing plants, trays to keep the containers in, and grow lights if you don’t have a south facing window, cold frame, or greenhouse. Loss– You definitely take a chance at loosing plants when you raise them from seed. It’s a tender process. Too much water, too little light, a slip of the hand, a “helpful” or curious toddler… all of these things can kill a fragile seedling in a single day. Not to mention the delicate matter of hardening off your plants to get them used to being outdoors before transplanting. This has been one of the hardest things for me to do without killing plants. Timing– Planting from seed requires that you know the right time to get your seedlings started. When to start your seeds depends upon your region, and whether the plants are a Spring, Summer, or Fall crop. Seeds need to be started several weeks either before the first frost, before the last frost, or after the last frost, depending on the variety. All of this needs to be taken into consideration to know the exact timing of when you should get your seeds started. Time– Buying already established plants from a nursery saves you from several weeks of babying tender seedlings. You can have your garden plants in one day. Done. Space– No worrying about where to keep all of your plants while they grow. When you buy from a nursery, they’re already ready to be put into the ground. Once you figure out where they’re going in the garden, your plants are out of your way for good. No Equipment Necessary– The plants you buy from a nursery are already hardened off and ready to go straight into the ground. You don’t need any containers or grow lights for nursery transplants. No Loss– You really don’t have to worry about loss when you buy already established plants. Of course, they can always die once in the garden, but you don’t take the chance of losing seedlings in the growing process like you would when growing your own. Timing– Is really a no-brainer. When the season is right, you just go and buy plants. No worrying about trying to figure out the exact time to get plants started, somebody has already done that for you. Cost– Plants are definitely much more expensive to buy than raising your own from seed. You pay a high price to let somebody else do the hard work for you. Variety– You’re really stuck with very limited options when buying from a nursery. 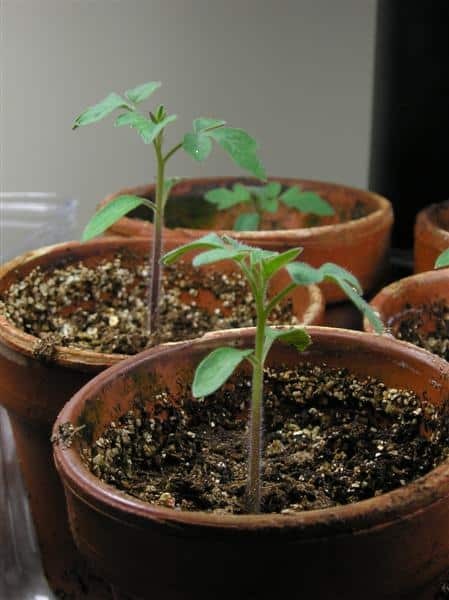 You may have three or four types of tomato plants to choose from, but more often than not you won’t find any exotic and exciting varieties to play with. Hybrids– You can bet that almost all of the plants you’ll find at the nursery are hybrids, which means that you won’t be able to save seeds for next year. Also, with hybrids you trade flavor and nutrients for hardiness and appearance. If you can find heirloom plants, buy those instead. Dependence– As long as you rely on a commercial greenhouse to raise your garden plants for you, you’ll always depend on them for your food. Learning to raise plants from seed takes time and experience. There is a huge learning curve if you’ve never tried growing from seed before. But if you want to have food independence, you need to learn how to raise your garden from seed. I admit, it’s nice to know that I can go out and buy plants for my raised beds if I need to. But it’s so much better knowing that I can raise that same garden for a whole lot less money, that I can have better tasting, more nutrient dense food, and that I don’t have to depend upon somebody else to get my garden started. Growing my garden from seed is a lot of work… but it’s SO worth it! Do you prefer starting seeds yourself, or would you rather buy nursery plants? Sourdough. And Beheading A Chicken. I really like that you mentioned that plants bought from the nursery are ready to go straight into the ground, and you can have all of your plants organized and set up in one day. My wife and I are renovating our yard and want to put in some new plants to improve the overall aesthetic. Thanks for the information-I think buying plants would be the perfect option for us! Thanks for talking about the pros and cons of both starting plants from seed as well as with buying plants from a nursery. I agree that buying plants will save you tons of time. Specifically, you talk about how buying plants saves you weeks of germinating plants from seeds. You also mention that if you buy plants, you don’t have to worry about making room for all of your seedlings. I do think that if you choose to buy your plants from a depot or nursery, you should talk to a professional about what types of plants will grow best in your yard. What about cost considerations? How much is it costing me to grow my own transplants in labor and materials vs. buying them. I was so excited when I came across your podcast today and now I’m having so much fun looking through your website and facebook page! I’m really enjoying learning new things through your experiences. We are in the “dreaming” stage of homesteading 🙂 We have attempted a garden for the last few years, but have only started from plants, never from seed. Where do you usually buy your seeds? Hi, Love to read about all of this type of activity. I have at present got in the seeds for my winter garden in mini hothouses. They are up and won’t be long before I put them in my garden. I live in Australia, so it is Autumn here. I am an organic gardener and as we have had lots of rain this last summer, the weeds are as high as me, so it is an endless task getting them under control. I agree that growing your own plants from seed is so much more cost effective – my only problem is that I lose several as they grow too spindly – any ideas to help? 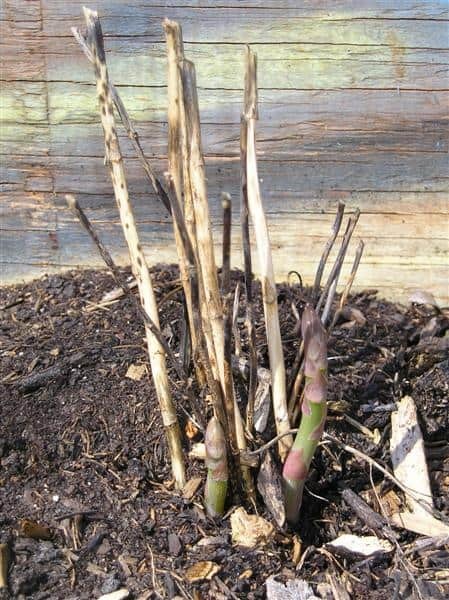 Spindly plants most often means they aren’t getting enough light, and are having to grow and stretch themselves to find it. Powder on the soil when you start plants from seed to help stop “damping off”. I read this in a garden book that does lots of different things for plants . No chems. I’ve heard that! I’ve also heard that cinnamon works well for keeping the top of the soil from getting moldy, as happens often when starting seeds. Thanks for the reminder!! Hi! I love your blog. I am starting a garden for the first time this year. I started seeds inside for many varieties and it has been so fun caring for them and watching them grow. However, for a few varieties that don’t produce fruit in the first season I plan to get plants. Starting a garden from scratch can be overwhelming in itself. Good for you for experimenting with learning how to grow from seed as well! Don’t be discouraged if you encounter problems… every year there are new things to learn, even when you’ve been doing it for years. Enjoy! My problem is waiting too long to plant things that take longer to grow like bell pepper and tomatoes. I haven’t had good luck with these yet and end up having to get plants because my pepper and tomato plants are too immature. I found squash, okra, and peas to grow from seed fairly easy. My hope is just that I learn something from my mistakes every year and maybe one day I will not have to buy replacement plants, because buying plants really is expensive compared to buying seed. Also this year I planted my okra seed I had saved from a few of last years okra and it came right up. It was so rewarding to see it come full circle from seed last year to okra we ate and then seed I planted this year. I start my own seeds every year and if I loose a few, then I go to the nursery to buy replacements. And I’m always disappointed in the lack of variety. I am currently surrounded by seed trays. I start everything from seed. Tomatoes, peppers, onions, melons cucumbers, herbs, tobacco, sugar beets, and strawberries. So far only the strawberries have failed, and some breadseed poppy seed did not germinate, but I think there were obvious problems with both, and my fault due to a move. I have had noticably better results with planting on the full moon, even in my living room. The big secret is temperature, most seeds like it warm. I have a greenhouse shelving thingy with a vinyl tent cover. It holds 8 flats. It starts in the living room window cover on, then the cover off after the seeds are up, then the front deck when it warms up with the cover on, then the cover comes off, then into the garden. Works like a charm. It takes courage to plant seeds when the view out the window is of 4 feet of snow and it is still below zero at night. The glorious tomatoes of every color and size are motivation for us. I even splurged on fancy seed this year, one of those sneaky packs with a second package inside the envelope, with exactly 12 seeds in it, and it was $4.99! Medusa peppers were just too cool to pass up. I also discovered this year the Big Canadian seed house is selling large packages of open pollenated classics at very reasonabale prices, cheap even. A nice big sack of wax bean seed was $3.00, lunch bag size, not a little envelope. This is my second year of starting my own seedlings myself instead of just going to the greenhouse. I absolutely love it! Even with all the losses I incur I still had lots of plants. I love the variety available and being able to grow organic heirloom seeds. It does take a lot of space and some time, but it is so worth it. Whenever I think about the price of my seeds I just remember how much I used to spend on just a few plants at the greenhouse! Hello There! I am a new follower through NetworkedBlogs on Facebook. I can’t wait to check out and read some of the older posts and catch up. I much prefer seed starting. Many I plant straight to the garden. Tomatoes and peppers, things like that, I start indoors. I love having a garden and being able to teach my kids that skill. I want to learn how to seed save next. Stop by and say Hi on my blog!